The Military Friendly® Company survey “investigates and identifies the organizations whose commitment to serving the military and veteran community is comprehensive in scope and meaningful in terms of actual outcomes and impact.” In short, the company is dedicated to supporting veterans – and encouraging other companies and schools to do so as well. Military Friendly® schools are committed to helping our veterans create better outcomes in their school careers – and their lives. Setting a rigorous standard provides a positive reinforcement for organizations and schools across the country to invest in the lives of veterans. All in all, a Military Friendly® standard is good for veterans, good for organizations, and good for the country as a whole! How Military Friendly® is South College? South College has been designated a Military Friendly® school since 2016. Plus, South College does more than just meet the rigorous standards required to be a Military Friendly® school. We’re proud to exceed each of the standards for all six categories that are required for the designation. The six categories where South College exceeds expectations for all military students are Academic Policies & Compliance, Admissions & Orientation, Culture & Commitment, Financial Aid & Assistance, Graduation & Career, and Military Student Support & Retention. 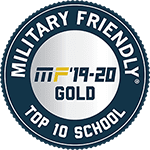 For the 2019-2020 academic year, South College earned a Top 10 School award from Military Friendly® – the best of the best! As always, our highest calling at South College is ensuring that we meet the needs of our students. And we’re proud to be able to serve our military students – past and present. Are you ready to start working towards your career goals at an exceptional Military Friendly® college? South College can’t wait to hear from you.